Why Celery Juice is the Hottest Health Trend will give you the explanation of why everyone’s adding 16 ounces of juice to his or her daily routine and the reasons you should too. Normally, I write about things that create a cozy life. I decided to write about juicing celery because having vibrant health is part of living a happy lifestyle. Lately, every where I turn I hear about someone singing the praises of drinking celery juice every day. I’ve been drinking celery juice for years, mixed in with cucumbers, fennel, lemons and spinach. I’ve never experimented with drinking just celery juice alone on an empty stomach. Finding organic celery at the grocery store has been difficult lately, and now I know why. You will also notice the price of celery has gone up as demand has increased. I first heard of drinking straight celery juice in my juicing group. The benefits of drinking this juice had everyone singing its praises, but there was a mixed reaction on the taste of celery juice. Personally, I like celery juice. Some people had a hard time drinking it. The advice was to mix other things in with it like green apple and lemon. After reading more about the topic, Medical Medium (the person that got this craze started), said that you should not change or add anything to straight celery juice. Not even ice. The reason for this is adding other things like water, lemon juice, or apple juice changes the structure of the liquid and hinders it’s healing powers. Also for best results, drink celery on an empty stomach, preferably in the morning. Celebrities are also raving fans of drinking straight celery juice. Every time I open a magazine I read about somebody famous drinking this amazing drink. Some of the celebrities that are celery juice fans are Sylvester Stallone, Kim Kardashian, and Jenna Dewan. They are showing off their glasses of fresh celery juice on Instagram. What I love this trend, nobody is trying to sell us something that we don’t know what the side effects are. Drinking celery juice is a good thing. The only way to find out if it works for you is to try it for yourself. I created a Facebook group called Creating a Cozy Life with over 3,000 like-minded souls. It’s a group where we share recipes, pictures of things that leave you in awe, and ideas on how to make your life just a little bit more snug. Join here to be part of the virtual cozy cabin. Make sure you wash the celery well. Cut up the celery in approximately 3 inch pieces. The smaller pieces are easier to run through the juicer without clogging it up. You can include the celery leaves or leave them off. The leaves make the juice a little more bitter. I don’t have an issue with them, but you might. 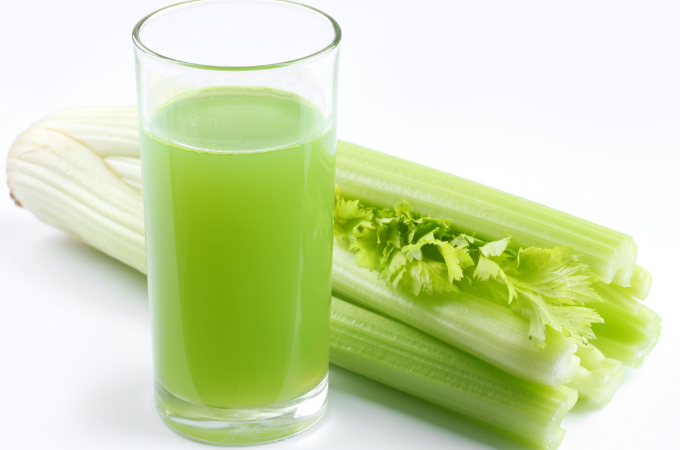 Run the celery through the juicer and drink immediately on an empty stomach. Raw vegetable juice can be kept in the refrigerator for up to three days. Make sure you fill your juice bottles to the top to prevent oxidation. The older your juice is, the more it loses vitamins and minerals. Medical Medium suggests working your way up to drinking 16 ounces of celery juice on an empty stomach in the morning. 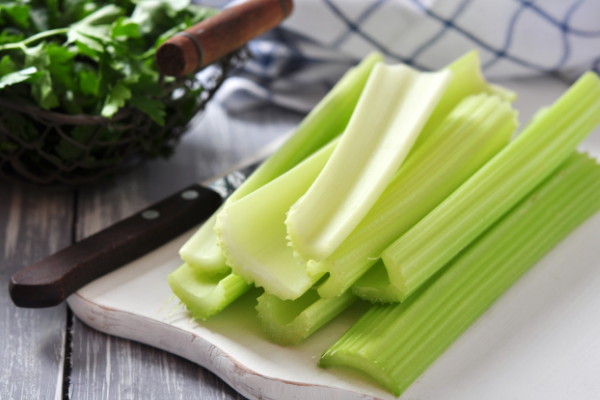 Celery juice is being touted as a miraculous healing liquid that can help with improving digestion, help your moods become more stable, weight loss, clearer skin, and increase your energy. Celery juice helps fight inflammation, supports a healthy gut and gives you immune boosting vitamins and minerals. It helps minimize cravings for unhealthy food. Most of us have a too acidic body. Celery helps balance your body because it’s an alkaline rich herb. Yes, you read that right – celery is really a herb. Celery juice helps cleanse your liver which is a really good thing. Non-Organic celery is one of the dirty dozen. The dirty dozen is a list of the twelve fruits and vegetables that have the most pesticide residue on them. If you purchase non-organic celery, you could be ingesting up to 67 different pesticides from eating it. The rest of the dirty dozen are blueberries, nectarines, apples, strawberries, cherries, grapes, peaches, kale, spinach, collard greens, potatoes and lettuce. This book will be coming out in May 2019. I’m so excited to get it, I’ve already preordered it! Here’s an interview on Youtube with Medical Medium himself. You can hear for yourself why drinking celery juice is important. We’ve reached the end of Why Celery Juice is the Hottest Health Trend. I hope you enjoyed it. Let me know in the comments below if you tried drinking celery juice and if you felt it made a difference in your life.